Rice is a wide spot on California’s Highway 62 and, some might say, seen too often on these pages. 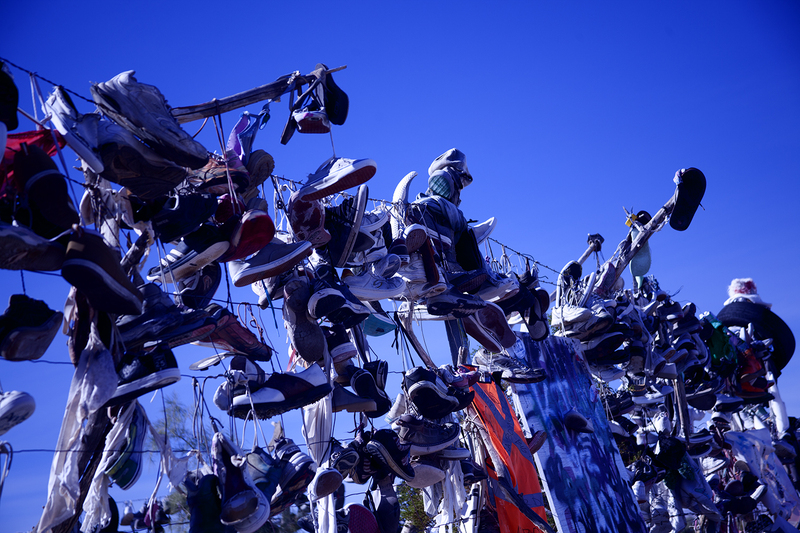 It's also home to a shoe garden. Right behind the shuttered service station and across the street from an old Santa Fe Railroad siding lays an entropic display of sneakers, boots and clothing. This was once the site of a shoe tree that burned down under suspicious circumstances. 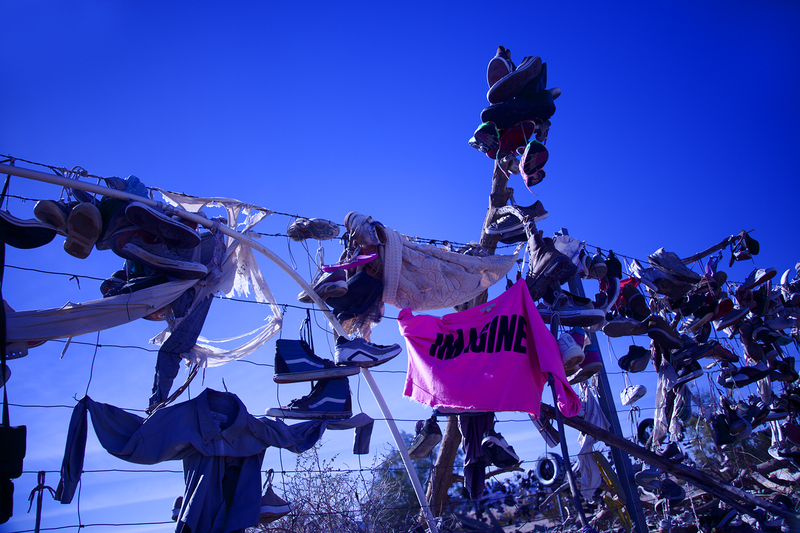 In its place has grown a bumper crop of footwear adorning a wire fence surrounding the footprint of a long gone building . The shoe garden has been so fertile that the fabled Mojave Desert shoe bees have fertilized the adjacent station so that leather and canvas blossums are blooming there as well. 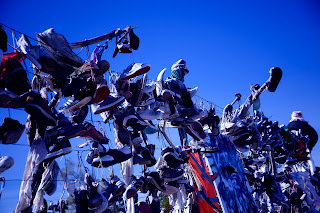 For yet another shoe tree drive US 50, America's Loneliest Highway, just west of Austin, Nevada where the most famous shoe tree once stood. That one burned in 2011 and has been replaced by a new one just 20 feet away. There's clearly evil afoot. Be on the lookout for a barefoot arsonist in a 1967 VW van with California license plate h8shoes. DElightful!! Love your humor Steve. Thanks Thea. We're on the road in SoCal. 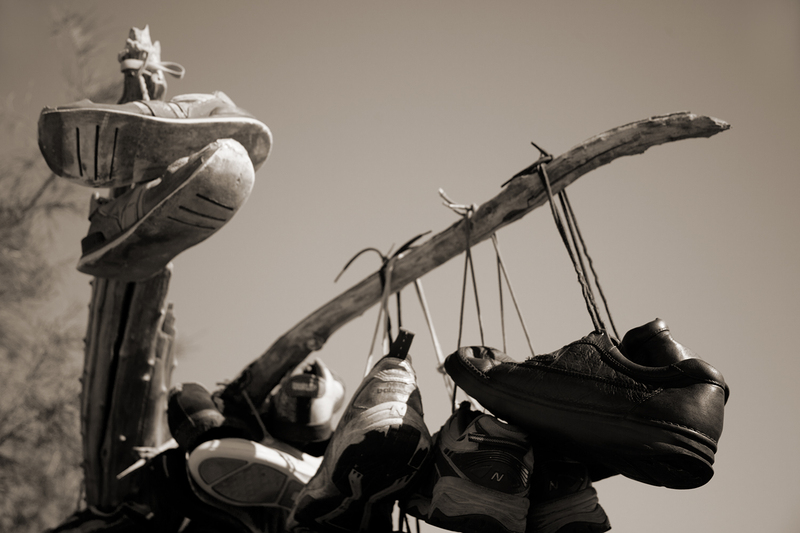 The shoe garden was early last week. I missed it with John in November. Your last blog absolutely knocked my socks off (pun intended). Loved the color, but this particular subject really lent itself to black & white in my opinion. as evidenced by the last photo . Loved the shots, devoured the verbage....another great post!! Thanks man. I did have some fun with that one.